Welcome back to another Ten on Tuesday-I hope your week is treating you well. The closer we get to the end of school (May 25th is our last day with students & the 26th is inservice) the more excited and exhausted I seem to get. But we can make it through another few weeks! I don't do my nails often, but this post has given me all the spring vibes & is making me want to treat myself to a fresh mani soon. Speaking of watching stuff; does anyone have any good Netflix suggestions? I kind of want to watch 13 Reasons Why, but I don't know if I'll enjoy it. I'm obsessed with the look of this Pinterest pin! I've got several old windows to repurpose (which is one of my goals for the month), I think the boxwood wreath adds the perfect layer. This Sunday afternoon, Chris and I took Forrest and met our friends Kane, Paige, and their sweet pup Daisy and headed for the Tallapoosa River to float at least one more time before they welcome their sweet little girl into their family! It was absolutely beautiful weather and gorgeous views! Y'all, I'm dying over the new glowy blush and bronzers that are on the market. They're seriously to die for. Y'all, look at my cute Mama in this picture from our last shopping trip! I finally got her in some Lilly and she looks so fab. If you're still looking for the perfect gift for your Mama, here's my Mother's Day Guide! I don't know about y'all, but most of my afternoons this week are going to be spent cleaning & working outside. If you need tips for my favorite cleaning products, check them out here. Y'all, like I need another pair of shoes. But this scalloped pair is killing me. I need to add it to my collection! If you're in a hurry this week and needing a quick recipe for dinner; Southern Living just put out it's 30 minute recipes and I foresee those sheet pan nachos making it onto our menu this week. 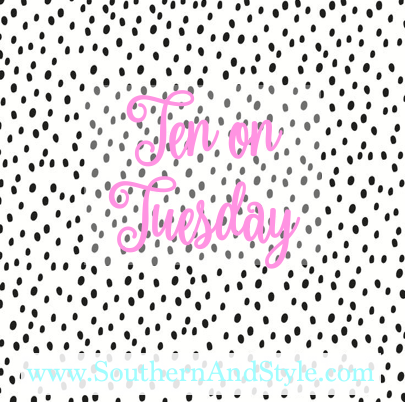 Well y'all, I hope you enjoyed this week's version of Ten on Tuesday; let me know down below what y'all are up to this week! 13 Reasons Why is okay IMO. I'm not obsessed with it though. We are also watching The Americans, Schitt's Creek (dumb but funny), and This is Us is still on our list!